RIR shares some practical tips about where to find the best free internet connection, have a light meal with a great view of the landing field and even go to a museum in Moscow’s airports. Sheremetyevo airport became famous around the world after hosting former CIA security administrator Edward Snowden for almost six weeks in the summer of 2013. He couldn’t leave the transit area of the airport because his passport was revoked by U.S. authorities over the disclosure of classified information by the CIA and the National Security Agency. In August 2013 he received temporary asylum in Russia, and a year later he got a three-year residency permit. His exact location is not disclosed for security reasons. What can you do if you are trapped at Sheremetyevo? To go online find the Wi-Fi network “Sheremetyevo Free,” then open a browser window with Sheremetyevo’s logo and click “NEXT.” The internet works best in terminals C, E and F. In Terminal D there is a free network that works best in the VIP-halls, at gates 01-03 and 05-08 on the second floor and gates 11-16 and 17-33 on the third floor. Very few people know that Sheremetyevo has its own museum. More than 2000 objects tell the airport’s tale since it opened in the late 1950s. The collection contains the airport’s first master plan, old aircraft and weather instruments, a souvenir key from Sheremetyevo-2 (from when there were two Sheremetyevo airports), historical documents and photos, and an assortment of airport staff uniforms from different eras. But most importantly, from the windows of the museum a breathtaking view of the airport’s airfield opens up. We recommend setting up a tour in advance. Nothing calms a nervous traveler more than a little dose of culture before their flight. The Sheremetyevo Creative Gallery is on a mission to acquaint travelers with Russian cultural life through the works of famous photographers, painters, sculptors and musicians. There are also international exhibits as well. Throughout Sheremetyevo there are photo exhibitions and art borrowed from great museums and festivals and other cultural events in underused areas of the airport. 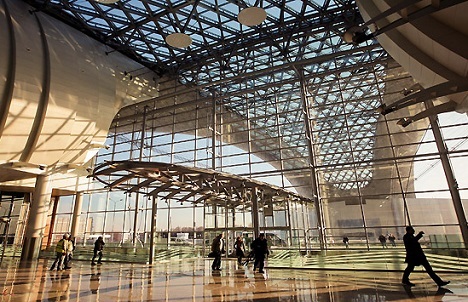 If you have reached Sheremetyevo airport by the Aeroexpress train be advised that check-in counters are a 10-15 minute walk. To help late passengers electric cars move through the public areas between the terminals D, E, F. You can find them near the exits from the Aeroexpress terminal. They operate between the hours of 7:00-23:00. Nothing shakes off a layover like a shower. Showers are located at the Baikal VIP lounge. For 200 rubles you will receive a towel, shower gel and soap. See the administrator of the lounge for assistance. Magically cheap food at the airport! To eat a big dinner at any airport in Moscow you should be ready to pay upwards of $30 per person. But there’s a secret 24-hour café at Sheremetyevo airport where you can dine for as little as 150-300 rubles. This dining room was designed primarily for airport staff, but passengers can eat here as well. A large variety of dishes are served and it is cafeteria style, so just point at whatever you like. And the food’s not bad. You can see a magnificent panoramic view of the runway from the windows of the Fifth Ocean (“Pyaty okean”) restaurant. It is by no means a cheap restaurant, but for your money you are offered a good selection of European, Japanese, Russian and Italian cuisine. The food here is fresh and never frozen. We recommend grilled salmon with ocean perch, rack of lamb in mint sauce and the pork mignon. But everything’s good here. The restaurant prepares its own desserts and cakes and there is a wide selection of French, Spanish and Italian wines, cocktails, whiskeys and cognacs. However, you can also just have a cup of coffee and admire the spectacular view. Use the free network “VKO-WiFi-Free” in Terminal A; username and password are not required. The speed of access can be limited during peak hours. Terminal B also has a Wi-Fi network, but it is not free. Visit the provider’s site and use a bank card. There’s nothing like a massage right before you fly or just after you land. Domodedovo features the 7 Colors Thai spa (“7 krasok”). Located in a quiet corner before the inspection area, it is ideal for both departing and arriving passengers. Try a 20-minute foot wash (810 rubles) or choose a variety of Thai and Balinese spa procedures, or a massage lasting from 15 minutes to three hours. The cheapest massage is just 480 rubles (about $8.60), but you might want to save the most expensive one for a special occasion: it costs 8830 rubles (about $158). There is a unique service at Domodedovo that is popular among travelers going to warm locales in the winter months. There is a storage room near the baggage area where you can leave your heavy winter coat while you take a break in paradise. It will be waiting for you upon your return.